Hi. Remember we went off air for a bit? Well went to Queensland on a holiday. Turned out to be a comedy of errors. It started when our plane was delayed, then spent further time circling the Gold Coast. We didn't get back to mum's til midnight. 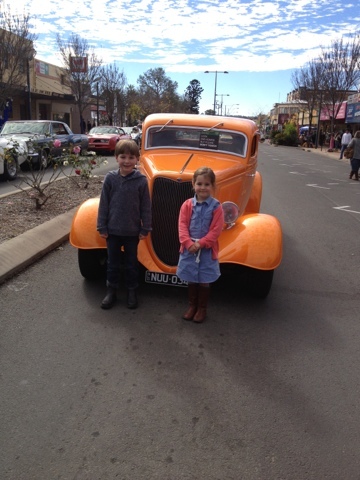 Thankfully Mum leant us the Silver Swan (1980s Camry) which is a spare car just for this type of occasion. This meant we were able to be independent which was fantastic. By the 3rd night Arthur was in Nambour hospital. I promise I will never complain about the LGH again. It is a 5 star resort in comparison. We were staying with my dear friend Kate who held the fort for me with our two biggies and her two (what a woman). In fact she spoiled us all rotten the entire 5 days we were there-the food was amazing, and she managed to cater for the gluten free vegetarian low GI requirements like a pro. In fact the cooking was magnificent. Ingrid and Mia chased the chooks most days (hmmm there was a curious lack of egg sandwiches on the menu though. Shame. She makes THE BEST egg sangas!!!). While the boys leggoed to their hearts content. 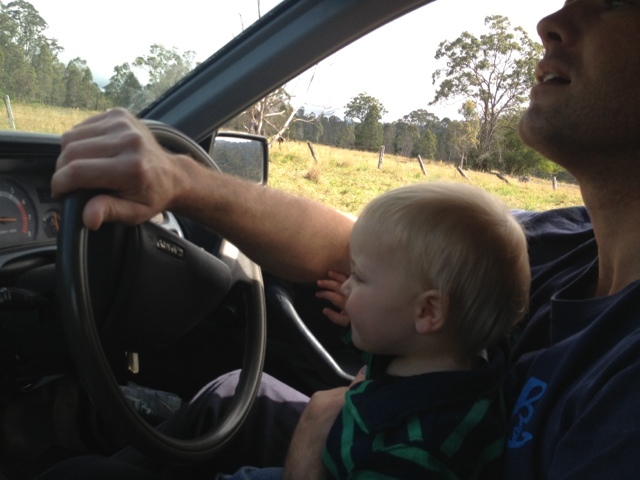 We then cruised down to Brissy to pick daddy up and had a few days at Kingscliff. Poor Sam came straight off night shift and little Arthur bear was still requiring ventolin during the night and we were all in the same very small room together. Made for a bit of a (understandingly) grumpy Papa Bear!!! 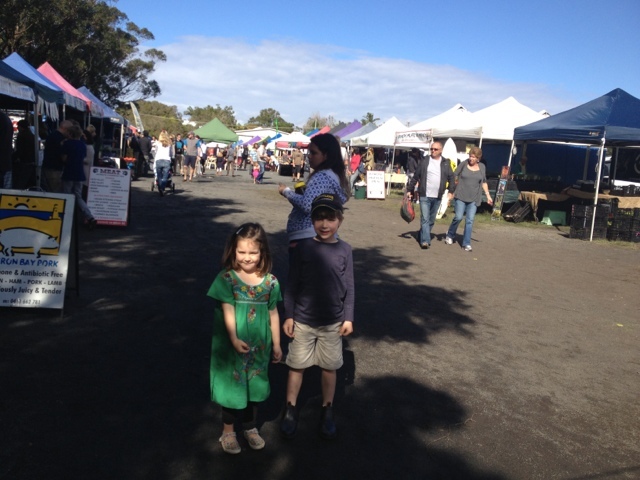 We had a lovely day eating our way round the Byron farmers market. We then headed down to Lennox and ran into an old friend. 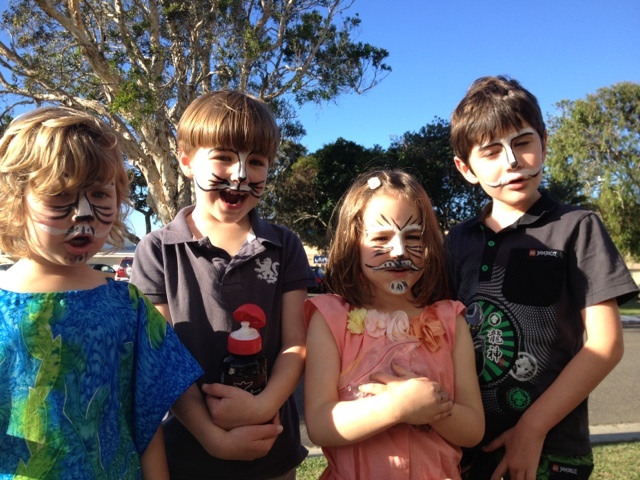 Then we stopped at Bangalow for arvo tea en route back to the caravan park. I drove the last leg while everyone we had a snooz. Poor George had some sort of reaction to something and when we got back he had such a swollen face the poor thing couldn't talk properly. He was white as a ghost too. 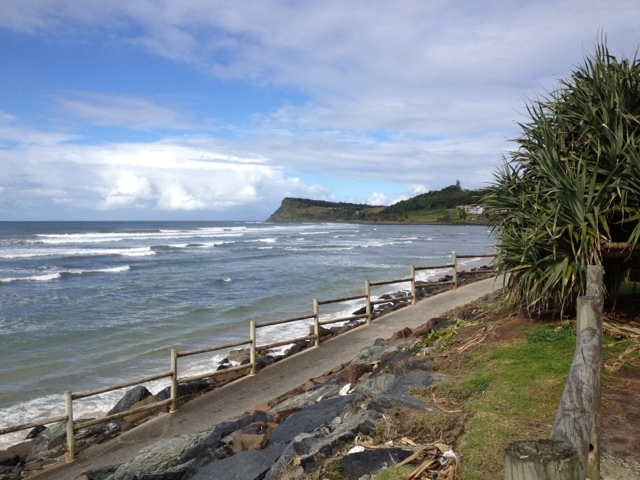 Then it was onto Grandpa James' new bachelor pad at Burleigh Heads for a few nights. I managed to lock the keys, my wallet, phone and ALL the groceries in the Silver Swan at Robina Shopping Centre. Poor James had to leave a meeting early to come and help. We ended up having to smash a window to get in (they don't make em like that any more). We did manage to find a wreckers yard with a spare window which was lucky!! We had such a lovely time at GPJ's, though the highlight for the kids was the pool and the beach. We also took him down to the farm for a day. 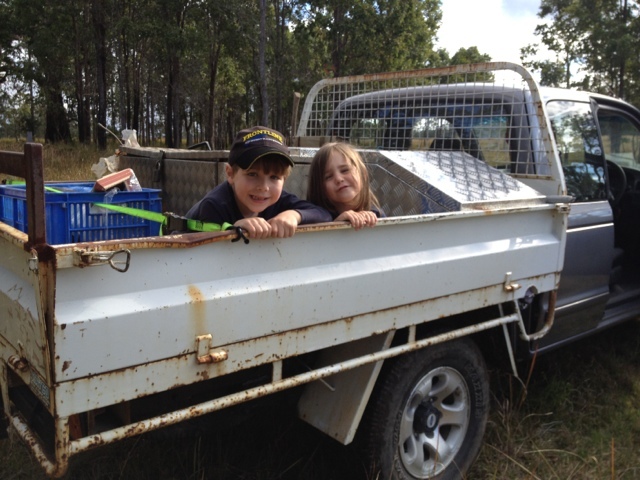 We built fires and the kids rode in the back of his ute and played in dirt (Arthur ate dirt) and generally had a wow of a time. Before we knew it, the week was over and Daddy was back on the plane. The rest of us headed back up the hill to Mums. She was still at the wedding in Bali for the first few days. And guess what? It rained everyone of those days. 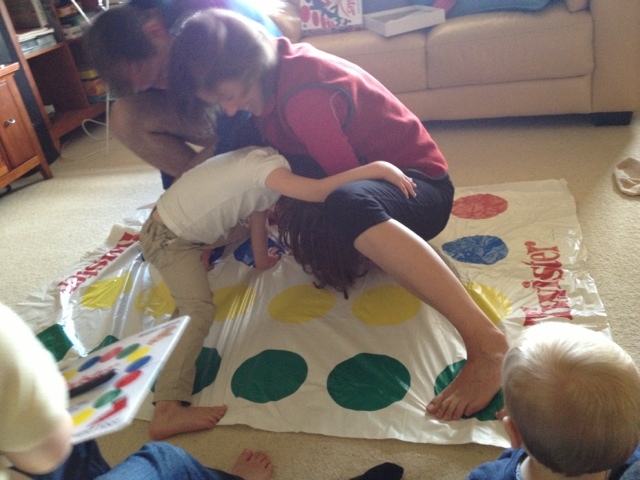 We did have one rainy day playing twister with Max & Helen which was a hoot. 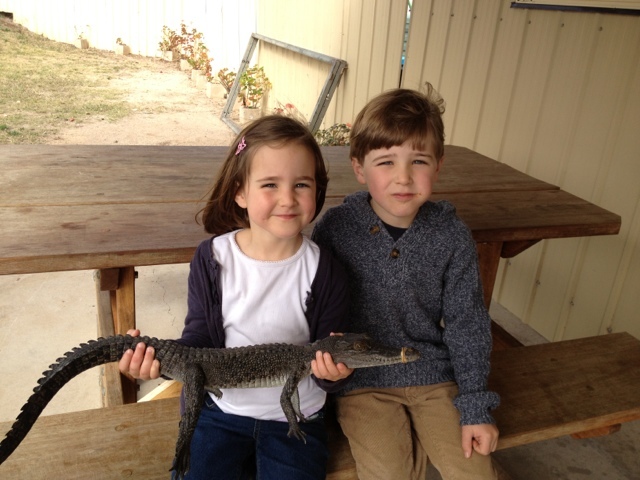 We also had an encounter with a baby salt water croc. Arthur promptly put its tail in his mouth and bit, hard.